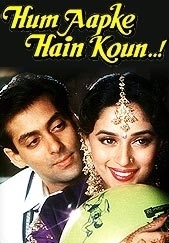 Hum Aapke Hain Kaun Hindi Movie (1994), starring Salman Khan and Madhuri Dixit and directed by Sooraj R. Barjatya, was the highest grossing film of 1994 and surpassed the total collections of even Sholay (1975). This family entertainer is sure to keep all ages glued to the screen, especially with the awesome on-screen chemistry of Prem and Nisha and the accompanying musical-feel given to a Bollywood movie. Hum Aapke Hain Kaun Hindi Movie (1994), with Salman Khan and Madhuri Dixit in lead roles, was directed by Sooraj R. Barjatya, a person who has flaunted family values and a deep understanding of love and marriage in his movies. This movie deserves much recognition for sticking to a traditional storyline and portraying the nuances of Indian culture. Though the movie is certainly long for Hindi film standards, the audience is sure to be captivated by the magic of all the actors on-screen. With big names like Mohnish Behl, Anupam Kher, Alok Nath, and Bindu associated with this film, you hardly get bored. You feel like you are part of the family, witnessing the events yourself and more than just a spectator, you experience the happiness, pain, and love of all the characters. Music by Raam Laxman is lovable and sweet; the movie is definitely a treat with 14 songs that capture all the moments perfectly. The evergreen voices of Lata Mangeshkar and S. P. Balasubrahmanyam allowed these tunes to achieve much fame and both Madhuri and Salman have added magic to the on-screen interpretation of these songs. If you are yet to know about Barjatya’s magic, this movie is his landmark film that has surpassed previous standards of film-making. He packs all emotions into this love story and tells the tale of Prem (Salman Khan) and Nisha (Maduri Dixit) as an experienced filmmaker. The story begins with Prem’s family looking for a bride for his elder brother Rajesh (Mohnish Behl). Immediately, Rajesh’s marriage is fixed with Pooja (Renuka Shahane), whose sister is Nisha. When Prem and Nisha meet for the first time, they argue and fight with each other, but Prem gets along very well with his sister-in-law Pooja. Both Rajesh and Pooja get married with much pomp and both Prem and Nisha share their happiness with songs and dances. Following the marriage, Nisha stays in Pooja’s house for awhile and both Prem and Nisha start to love each other. Soon, Pooja gives birth to a son and celebration follows. In this happiness, Pooja comes to know that both Prem and Nisha love each other and promises to get them married. Will their love be victorious? Will they end up getting married? No doubt that Madhuri Dixit shines throughout the movie. Be it the romantic moments or the lighter ones, the more serious scenes or even the songs, she puts her own magic up front. Her Filmfare Award for Best Actress is well-deserved. Didi Tera Devar Deewana sung by Lata Mangeshkar and S. P. Balasubrahmanyam – a song that captures Prem’s and Nisha’s love story quite well; the choreography is commendable and the actors portray their happy-go-lucky on-screen magic. Prem’s and Nisha’s first meeting, which has all the elements of comedy and the characteristic cough reminiscent of this movie. The timing is perfect and the two meeting for the first time leave the audience asking for more such moments – which they do get as the movie progresses. Salman: Kisi aur ke bare mein sochne ki fursat kise hai? Sirf aapse toh hum yeh gustaki kar sakte hain. Madhuri: Kyun? Hum Aapke Hain Kaun?